Who does not know with Chinatown? Especially for those who like shopping. 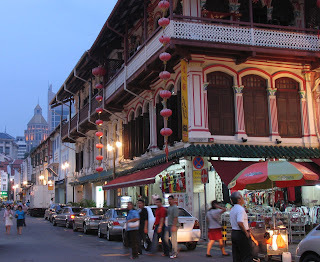 Chinatown is a district in Singapore which is always visited by travelers. 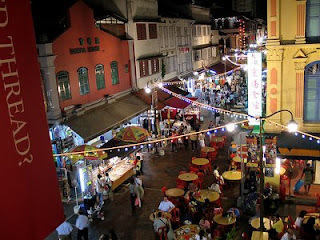 Chinatown, a regional trading center in Singapore which is never empty of visitors. Range of goods offered and sold here. The price offered was relatively cheaper. Many thing that you can do in Chinatown like shopping or just sightseeing. Ranging from souvenir trinkets like key chains, brooches, lighters, t-shirts, fan, wall hangings, to shirts and shoes can be easily found along Pagoda Street or Smith Street. All kinds of good food at a price that can be tilted easily found along the Food Street. Even more fun here again there is a market that is open 24 hours. In addition to the traditional shopping center, in Chinatown was a lot of interesting places to visit like the Temple and Pagoda temples. What's interesting about this city is the ornate ornaments found in every home or outlets especially when the night had arrived and the lights turned on so that Chinatown become more alive. Chinatown is never sleeping. Morning, afternoon, evening, and night is always crowded bustle of tourists from that line of argument by the sellers. The atmosphere is really looks interesting, all the people who come from different countries into a crowd gathered.